Ms. Cupcake » Celebrate The Vegan Festival Of Britain With An Animal Aid Cupcake! Ms. Cupcake > News > Cupcake News > Celebrate The Vegan Festival Of Britain With An Animal Aid Cupcake! Celebrate The Vegan Festival Of Britain With An Animal Aid Cupcake! Shout loud and proud for The Vegan Festival of Britain! Raise a cupcake or two for Animal Aid’s 40th Anniversary celebration! Ms. Cupcake are over the moon to help the brilliant Animal Aid celebrate their 40th Anniversary. The pioneering and peaceful animal rights charity have led the way in changing animals lives for the better across Britain and beyond. If you haven’t heard the news, hundreds of vegan events have been organised between the 20th May – 10th June under the name, The Vegan Festival Of Britain. 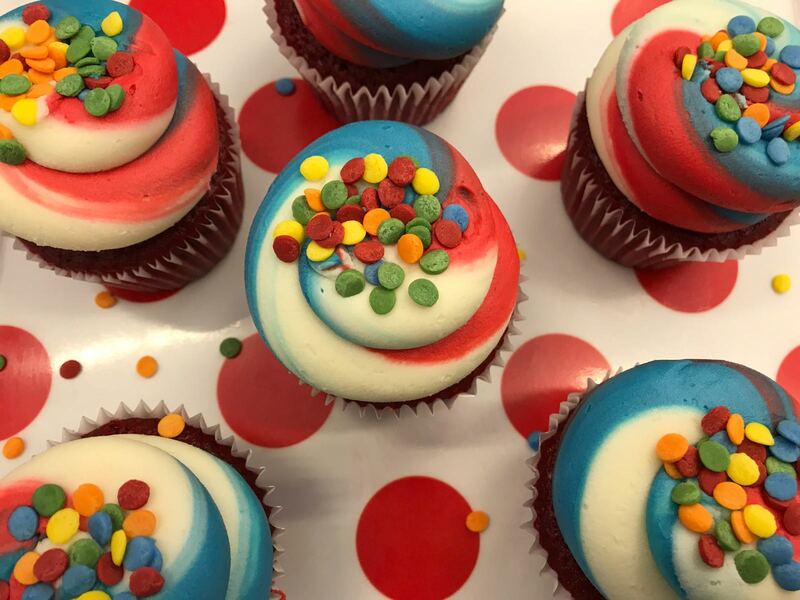 The Animal Aid Cupcake is a nod to not only the British flag, but to the vitality of Animal Aid. To the aliveness of veganism in Britain and beyond. And you never want to eat a dull cupcake, right?! Between 20th May and 10th June you’ll be able to pick up the Animal Aid cupcake at our Brixton shop. The item costs £3.50 with a pound from each sale going direct to Animal Aid. This entry was posted on Wednesday, May 17th, 2017 at 2:00 pm and is filed under Cupcake News. You can follow any responses to this entry through the RSS 2.0 feed. Both comments and pings are currently closed.